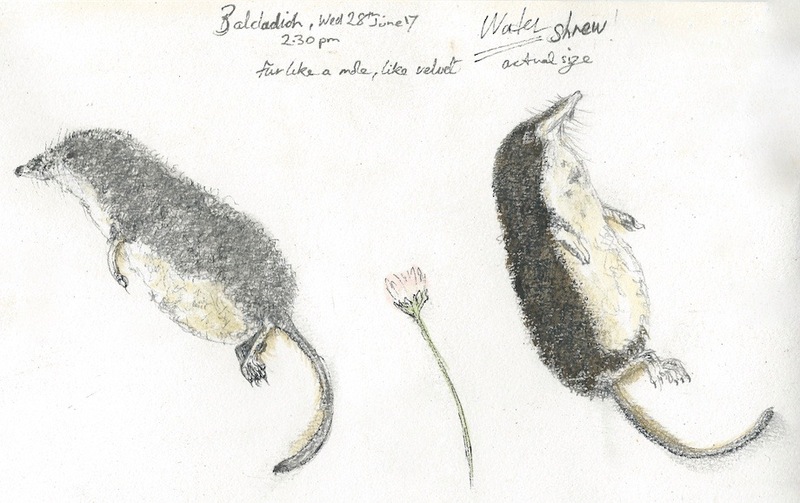 On 28th June 2017 I met Anne Nicoll at Stoer and she mentioned that she had earlier on found, and drawn, a dead shrew that looked a bit unusual on the shoreline at Balchladich (NC026304). She had left it on top of a stone and I asked her to re-find it if possible for me to see, which she did. It was a fine example of an adult water shrew, Neomys fodiens, velvety black above and silvery-grey below. Water shrew is the largest of the three shrews found in Assynt, this individual measuring 140mm from nose to tip of tail and weighing about 14gms. It may have been caught by a larger predator, such as a cat, and discarded as inedible, or may just have reached the end of its natural life; shrews only live for about 18 months. Balchladich is a new site for this species and only about the third time that it has been found locally on the shoreline, where there is probably good hunting under rotting seaweed and other debris for invertebrates such as sandhoppers and fly larvae.